A bit more than a year ago I wrote about Guitar Rig 2, Native Instruments’ flagship product for Guitarists. Guitar Rig 2 was an excellent product in most ways, with exceptional sound quality, a solid foot controller and several improvements over the original. About two years since Guitar Rig 2 hit the shelves (and the online shops), Native Instruments came out with its successor, Guitar Rig 3. This is the cosmix.org review of the latest in the series of NI’s pro guitar line. Let’s get over the trivial stuff first: for those using a Mac, Guitar Rig 3 is now a universal binary out of the box and is also Leopard (Mac OS X 10.5) compatible — you can also use it with Tiger of course. For those still stuck on Windows, you can run GR3 on Windows XP SP2 or Windows Vista boxes. It’s price is about the same as its predecessor’s: around €499 for the full version, €299 for the sofware only version and €99 for those upgrading from previous versions (software only). Other options for those interested in upgrading the hardware or upgrading from Guitar Combos also exist. Check the site for more details about pricing in different currencies etc. Guitar Rig 3 comes with Rig Kontrol 3, the new foot controller that replaces Rig Kontrol 2. It is mostly an evolutionary step forward — as opposed to a completely new design, as was the case with Rig Kontrol 2 versus the original. The new controller provides 8+1 switches (instead of 6+1), a pedal, VU meters for input and output and is black. Most importantly the black aluminum box conceals a brand new new sound interface borrowed from the Audio Kontrol and offering much higher fidelity DAC and a 24bit/192KHz audio interface (it was 24bit/96KHz on Rig Control 2). Rig Kontrol 3 retains the USB2.0 interface — what else would it have? Other than that it doesn’t seem to have changed much with the, now customary, MIDI, input and output connectors on the back. The latest version of GR adds four new amplifiers to its arsenal, bringing the total to twelve. If Guitar Rig 1 was considered stark in its tonal offering, sacrificing range for quality, Guitar Rig 3 is extremely lush in both. There are few, if any, sounds that cannot be reproduced faithfully by Guitar Rig 3. The new amplifiers are Ultrasonic (modelled after Bogner Überschall, for those metalheads among you), Citrus (modelled after vintage Orange amps), Tweed Delight (yep, that’s a Fender Tweed Deluxe) and High White (a Hiwatt DR-103). The tonal palette is truly enormous and has rectified (pun intended) some of the main concerns users of previous versions had expressed. In addition to the new amps, NI seems to have taken some steps towards supporting those users that have better things to do than configuring amps and mikes. While the same powerful, modular component for selecting and configuring the type of speaker, microphone position and type is still there, a new component called ‘matched cabinet’ pairs the amp with the cabinet you’d find if you actually bought the thing. The options provided for the matched cabinet are very simplified yet still powerful enough for you to get a taste of sounds the amp provides: you can choose between two different microphone types and the amount of ambience in the sound. Two sliders allow the user to choose the exact point between the available options. I found the addition useful for experimenting, rehearsing and jamming, but I also appreciate the fact that the more complex and powerful ‘Cabinets and Mics’ component is still available. Guitar Rig 3 also adds six new effects that bring the total to 44. Tape Echo, provides the classic cascading echo found in 1960s and 1970s recordings. Delay Man is a delay unit with chorus and vibrato added on, Sledge Hammer is a new distortion effect unit (resembling Marshall’s JackHammer), RealWah is another Wah pedal and Ring Modulator is the classic modulation effect. Also introduced in Guitar Rig 3 is a Custom EQ component for fast tweaks. NI has a page showcasing all 44 effects included in Guitar Rig 3. Despite all of the above, an immediately obvious, and arguably very important improvement between the two versions is GR3’s User Interface. 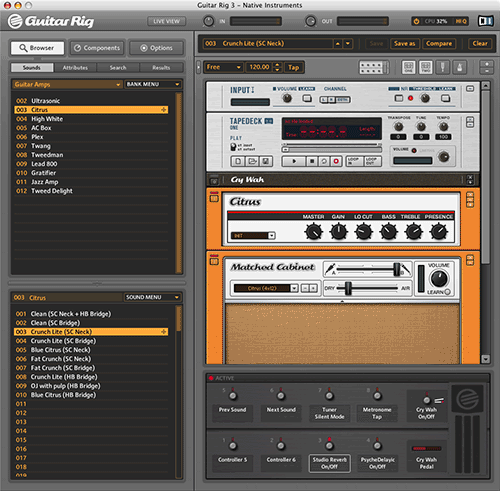 Besides the functional improvements, Guitar Rig 3 sports a revamped user interface. The layout of the window is simplified while still familiar for those coming from previous versions. On the right the familiar rack is still there just under the top bar that contains VU meters and volume knobs for input and output as well as a ‘power’ switch, a CPU usage indicator and a ‘Hi Q’ button that doubles the internal processing sampling rate. During our use of the software, even with Hi Q the CPU usage was acceptably low peaking at about 50-60% on a Dual PowerMac G5 (with some exceptions that are going to be discussed a bit later). The new controller setup interface seems a bit weird after using GR1 and GR2, but you quickly get used to it. First of all it is now located on the right part of the window, just under the ‘rack’. We used Rig Kontrol 2 most of the time (as we only upgraded the software) and while there is a mismatch between the switches on the screen (there are eight + 1 under the pedal, as in Rig Kontrol 3) and the switches on our foot controller (six + 1 on the Rig Kontrol 2), the configuration is relatively painless. We would have preferred for the software to detect the version of the controller and show an appropriate graphic instead of the Rig Kontrol 3. On the plus side, you can use any MIDI controller to control Guitar Rig 3, so even if you don’t have a NI foot controller, that’s fine. The left pane, where the preset browser, component list and options are found has been completely revamped. There are three main buttons (Browser, Components and Options) that select the content of the pane. What do you think about the Pod? I haven’t used the Pod (and I’m talking about the original and V.2) since the early 2000s. As such I cannot really provide a good comparison between Guitar Rig and the Pod X3. If you asked me about Pod 2.0, my answer would be that Guitar Rig blows the Pod away, both in terms of flexibility and sound quality. One of the main good points of the original Pod (and V.2) was the quality of some of the high-gain sounds. This, coincidentally was also one of the gripes people had with Guitar Rig 1 and, to a lesser extent 2. This was probably due to the different goals of the two companies. Some people thought the Guitar Rig sounds weren’t heavy enough and others thought that while heavy, the sounds were not as accurate as they’d like. Guitar Rig 3 (and especially the free 3.1 upgrade that came out in early 2008) has completelyu resolved this and I think you’d probably need to shell out many thousands of Euros (or Dollars or whathaveyou) to get something even close to what GR3 offers; overall I find the sound of Guitar Rig 3.1 superior to every other modelling software I’ve seen, including for high-gain presets. Having said that I’m not sure how much better to the Pod 2.0 the X3 model is. The fact that Guitar Rig involves a software component probably makes live performance a bit more awkward (you have to carry a laptop) than the Pod, but it also makes experimenting and preset creation much more fun as you get a visual representation of the amplifiers, pedals and other effect units, instead of a small dot-matrix LCD display and some clumsy controls (if I remember something from the Pod is its horrible controls). Finally, if you’re concerned about playing live, the Kontrol Rig (pedalboards) of Guitar Rig 2 and 3 is a solid piece of hardware, with excellent audio quality and ready for live performances. I would recommend the Guitar Rig, not only because I’ve had a great experience with it, but because — for me — it realises the dream of every electric guitarist: (almost) total freedom in sound expression and a very intuitive way to get there. I have the Pod, an XT Pro and a GuitarPort and have the POD Farm software/plugin. I am looking at getting Guitar Rig 3 because POD Farm is so unstable. I am running it on a Mac Pro Dual Quad with 6GB of Ram and in standalone mode it locks up all the time, in plugin mode sometimes it gets made and just refuses to have any effect on the track. It defaults to a Jazz Clean amp and nothing you do will get your sounds back. I heard the Pod X3 doesn’t run efficiently on Windows Vista 32 bit (which means I am out of luck). I read further on their forum that there were complaints on the sound quality and the lack of sound coming from the PC with the pod hooked up. I am considering purchasing the guitar rig 3, but I am nervous as to whether or not it will work properly with my PC. I have a Dell Inspiron 1508 with Windows Vista 32 bit. I don’t want to purchase something that will not work with my PC. I am wanting to know do you have any suggestions as to if I could research further on the matter? @Dustin: I have seen GR3 run great on XP and Vista 32bit on relatively old hardware (check the system requirements for GR3 on the official product page), but then again I don’t use Windows myself so my experience with GR3 on that platform is limited. hey cosmix thanks for all the info! i am considering purchasing GR3. i have used Amplitube 1 in the past but could not find a heavy metal tone that sounded good. (it sounded very digital to me) i was wondering if GR3 offers a heavy tone that sounds more realistic? Hi, I really need some help. I want to use and old ART x-12 to control my guitar rig 3 software but I don’t know how to set it up. Can anyone explain how to do this? It would be deeply appreciated. @fragle598: I’m not familiar with the ART x-12, but there’s a lot on controlling GR with MIDI online; try googling for it and also check the NI forum. 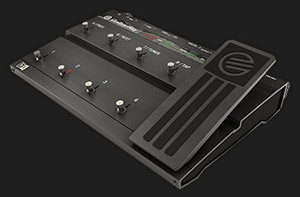 so ill be able to use my Line 6 FBV Shortboard MKII Controller Pedal with it? @TMcneil: Searching online for what you asked could’ve answered your question way faster than posting this comment. Short answer: Yeah, it seems so.